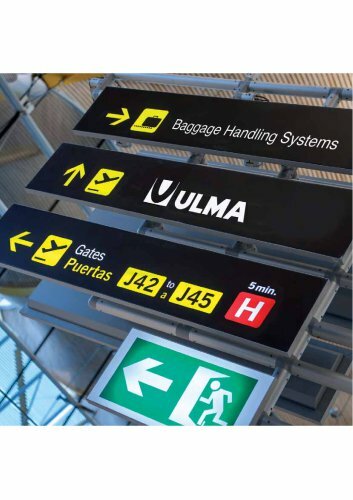 BAGGAGE HANDLING SYSTEMS At ULMA Handling Systems we develop our activities in Integrated Engineering in Material Handling Systems through an extensive range of logistics solutions aimed at the field of automatic distribution. With regard to Baggage Handling solutions, we design and develop integrated baggage handling systems backed by our vast industry experience and an extensive range of products and modular solutions that are tailored to the functional needs of any airport. INTEGRATED LOGISTICS ENGINEERING Our solutions are tailored to the specific needs of each customer, where we offer services in both Domestic Airports and renowned International Airports. We offer integrated logistics solutions which span the entire value chain, from systemic design of the logistics process to the in-house design of equipment for billing, transportation, inspection systems, storage and sorting. TOTAL TRACEABILITY Our solution in the field of logistics software is IKLOG, a logistics suite offering an integrated solution to all areas related to logistics. In the field of airports, we provide comprehensive, reliable and accurate traceability software, enabling integration with other barcode systems, RFID ... PLC and IT control based on ULMA’s "Baggage Control System" ensures that the course of baggage may be precisely tracked. Handling Systems 20560 Onati (Gipuzkoa) SPAIN VALENCIA BRANCH Ctra. Llano del Quart km 3,2 Edificio Salvesen Logistica 46960 Aldaia (Valencia) SPAIN (Barcelorla) SPAIN Avda. Isidora Goyenechea Santiago- Chile Calle Monte Rosa 255 4to piso Chacarilla, Santiago de Surco, Lima.